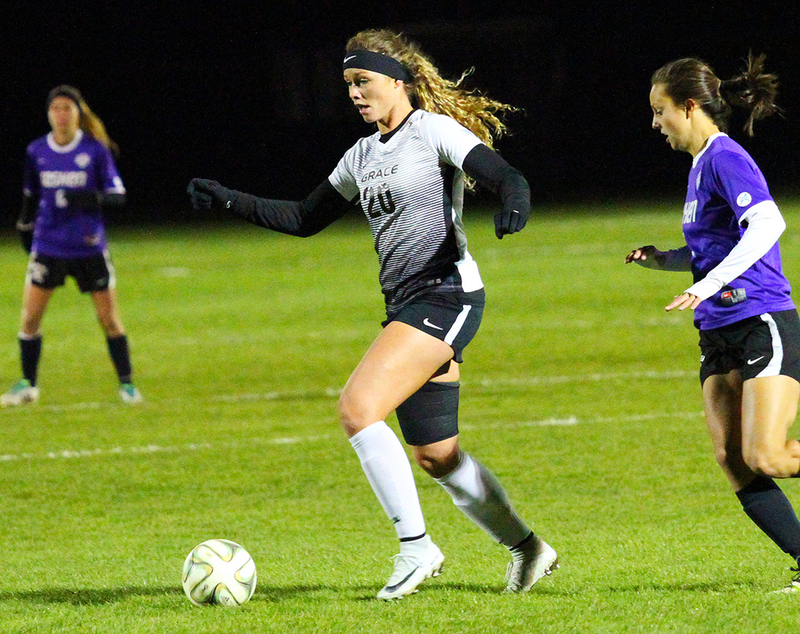 WINONA LAKE – Grace’s women’s soccer team wrapped up the regular season with a 1-0 win over Goshen on Saturday. The Lady Lancers (7-7-4, 4-4-1 Crossroads League) won on a second-half goal from Allison Vroon at 1st Source Bank Field. The victory secures Grace as the No. 7 seed in next week’s Crossroads League Tournament. Grace will play at Marian on Wednesday in the quarterfinals. Grace dominated possession and chances in the first half. The Maple Leafs (3-12-2, 0-8-1 CL) saw little of the ball at their half of the field, and Grace kept near-constant pressure at Goshen’s end. The first three legitimate goal-scoring chances of the half came from the combination play of Corinne Villalobos and Flavia Faria. With 15 minutes of the half, Faria teed up Villalobos for a shot at the top of the penalty box which went high. Five minutes later they connected again, but Villalobos’s attempt to the upper corner of the net was saved at the last instant. The duo found a third chance shortly after. Villalobos’s rising shot beat the goalkeeper but clipped off the crossbar. With 10 minutes left in the half, Grace earned a free kick at the top edge of the box. Liz Van Wormer’s shot was blocked, and the rebound was also saved. The half ended scoreless despite Grace holding a dominant 16-2 advantage in shots. The Lady Lancers had 10 shots on goal, two apiece from Villalobos, Vroon and Van Wormer. Grace picked up its assertiveness to start the second half, which produced the go-ahead moment. Sacia Hanson sent in a cross which found Vroon at the far post. Vroon’s first shot clanged off the crossbar, but the rebound fell back to her which she scored from close range at the 55:29 mark. The Lady Lancers were not finished, holding a 7-2 shot advantage for the rest of the match. But the Maple Leafs kept Grace off the scoreboard again, holding on for the 1-0 scoreline. For the match, Grace outshot Goshen 29-4. The Lady Lancers had 15 shots on goal as well as a 4-1 advantage in corner kicks. Abby Schue earned the shutout in goal, the 43rd of her career. She was protected well by defenders Aubrey Feipel, Sabina Meyers, Carlie Salinas and Hannah Tkacz. Saturday was also Senior Day to honor the graduating class of Emma Neahusan, Meyers, Salinas and Schue.